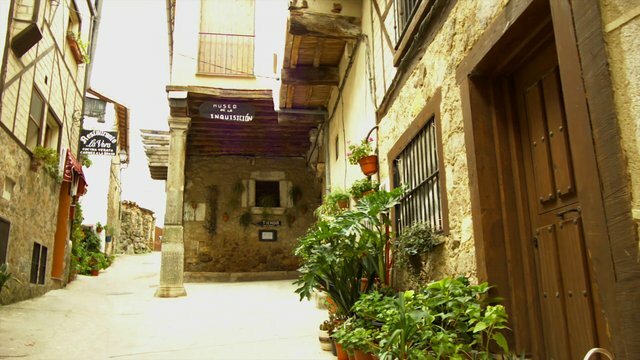 Garganta la Olla is a municipality in Cáceres sheltered by the Sierra de Tormantos Mountains and declared a Site of Historic and Artistic Interest. It is only a few kilometres from Jaraíz de la Vera and Cuacos de Yuste. Situated in the Comarca de la Vera region and also close to the Monastery of Yuste, its gorges, as its name says ("garganta"), are a prominent feature. If you would like to discover its artistic heritage for yourself, we recommend starting at the parish church. This building was built in the 16th century and one of its greatest treasures is a Baroque organ, which has been restored. Another of the most important buildings you can visit is the Shrine of Santísimo Cristo del Humilladero, which is made up of a single nave and was built in the 16th century. It has been refurbished over the years and the most important feature inside is the altar made of tiles from Talavera, and the coat of arms that dates from 1560. The town has an interesting house, Casa de las Muñecas, which used to be a brothel used by Charles V's entourage, when he was living in the Monastery of Yuste. One of its striking features is that it is still blue – it was painted that colour so that it would be recognised. Places that are a must include La Huerta neighbourhood which possesses many beautiful corners, as well as Casa de Postas, a house that used to be an inn for travellers in Carlos V's time. Discover Casa Carvajal, the only place that has a coat of arms on the façade, because the Viceroy of Naples, Don Pedro de Carvajal, was born there. As well as being steeped in history, Garganta la Olla also boasts true caprices of nature. You can start by exploring the gorges, whirlpools and pools you can find before entering the town, coming from Cuacos de Yuste. If you drive here, you can leave your car in the car park nearby. Start by going upstream, and wear suitable footwear because the path is complicated. If you get tired, just sit by the river and enjoy the mystery of nature and its warm chestnut trees. Garganta is also known for the legend of "La Serrana de La Vera", a brave woman who used to seduce men and kill them in the mountains in this area. There is a statue and even a festivity in commemoration of this figure. Enjoy a unique town in which time seems to have stopped thanks to its well-preserved architecture. Get ready and enjoy everything Extremadura has to offer.